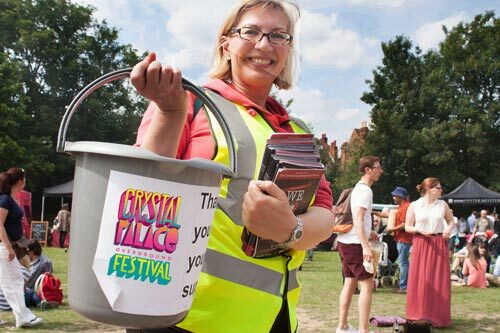 We are now registering volunteers to help deliver this year’s Crystal Palace Festival. We are very excited about our plans for 2019 as we have changed things up quite a bit to focus more on supporting local artists, community groups and the local economy. Our themes for this year are community and well-being. The park event is smaller than 2018 and 2017 with 9,000 visitors expected and it will take place across two days 15 and 16 June 2019 on the site behind the bus station in Crystal Palace Park. You can download a copy of the volunteer information pack for 2019 here to find more about the roles available. If you would like to help then please can you fill out the registration form by clicking here and we will be in touch to confirm shifts soon. To get in touch with us about volunteering now please contact our Festival Director Noreen at info@crystalpalacefestival.org. NB. We will only use your contact details to get in touch about volunteering for the Festival and we will contact you by phone and email. If you would like to receive marketing information about the Festival programme please click here to join our mailing list. We are really looking forward to hearing from you and welcoming you onto the team! “Meeting so many amazing performers and volunteers and seeing months of hard work pay off!” “Meeting new people, making people feel good about being part of the Festival, I loved the buzz and sense of being part of something bigger” “Feeling I was part of something bigger in the community – great atmosphere – sounds corny but seeing people smiling as they left is a nice feeling…” “Fresh air, exercise, challenging myself” “The feedback from the crowd, such as “You guys did a really good job and made it happen. Thank you.” Some other volunteering opportunities from our friends in Crystal Palace Park – please click here to see other current opportunities. Keen to get started? Sign up Below!